Refried beans, seasoned ground sirloin, creamy white queso, sour cream, avocado verde salsa, & fresh pico de gallo. Four battered & deep fried grande jalapeños stuffed with a mix of ground beef & cheese. Served with an avocado ranch sauce. Cup of soup & a small house salad. Three corn tortillas topped with onions, cilantro, spicy tomato salsa, & your choice of carnitas, carne asada, or tinga. Three Flour Tortillas with fried shrimp, jalapeño slaw, cilantro, onion, and salsa verde. 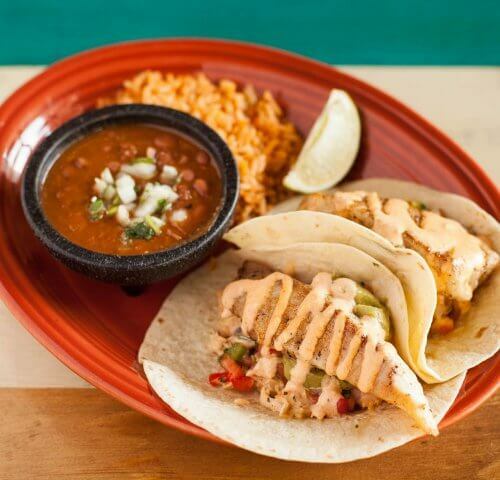 Fried or grilled, three flour tortillas topped with jalapeño slaw, pico de gallo, guacamole, & a red chile aioli. Served with rice & beans, or fruit. 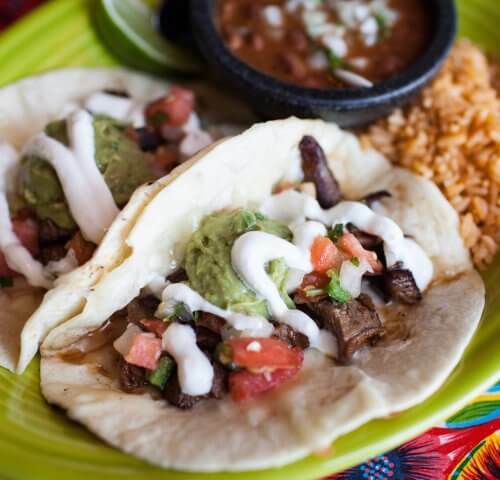 Three flour tortillas with smoked steak, jack cheese, guacamole, crema, pico de gallo. Served with rice & beans, or fruit. A flour tortilla filled with marinated slow roasted pork in our green chile-tomatillo sauce, refried beans, & Poblano rice. Topped with white queso, avocado verde salsa, pico de gallo, served with sour cream & guacamole. A large flour tortilla filled with smoked chicken & jack cheese. Fried crispy & topped with white queso, avocado verde salsa, & pico de gallo. Served with rice & choice of beans, or fruit. A large flour tortilla filled with cheese, refried beans, Poblano rice, & your choice of chicken, ground beef, or carne asada. Topped with white queso, salsa roja, pico de gallo, & served with sour cream & guacamole. Crispy corn tortillas simmered al dente in our red chile salsa, topped with smoked chicken, jack cheese, aged cotija cheese, Mexican crema, onions, & cilantro. Served with rice & choice of beans, or fruit. 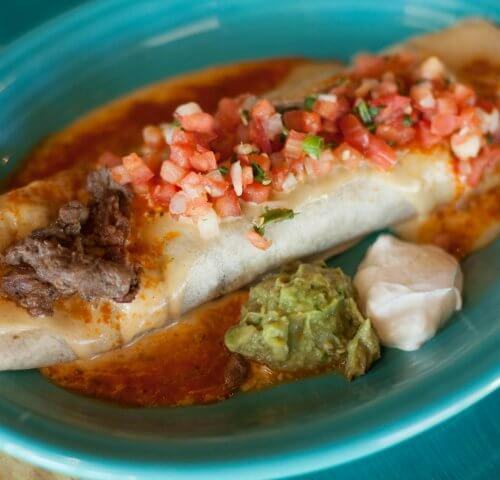 Smoked steak & cheese stuffed flautas served in a bowl of white queso & verde salsa with sour cream & pico de gallo. Served with rice & choice of beans, or fruit. One cheese enchilada & one pork tamale, smothered in chili con carne, served with rice & beans, or fruit. Two cheese enchiladas & two pork tamales, smothered in chili con carne, served with rice & beans, or fruit. 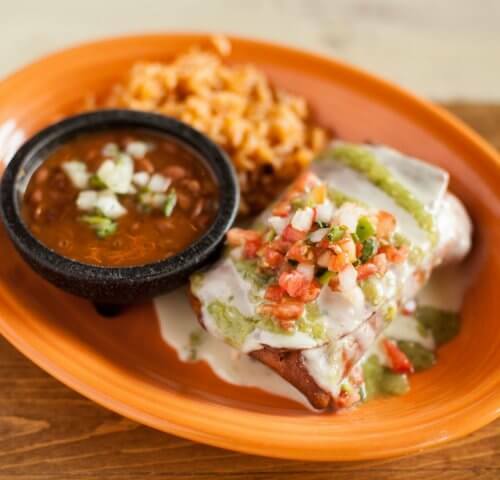 Three chile verde pork enchiladas with monterrey jack, cotija, & salsa verde, served with rice & beans, or fruit. A basket of 4 warm sopapillas served with a side of honey. Four Bavarian Cream filled churros with your choice of cinnamon sugar or strawberry topping. Two corn tortillas covered in salsa roja, with refried beans, eggs, cotija cheese, avocado, Mexican cream, & your choice of chorizo, carne aside, ground beef, of smoked chicken. Served with fruit or breakfast potatoes. A large flour tortilla filled with scrambled egg, corn & black bean salsa, your choice of chorizo, carne aside, ground beef, or smoked chicken, topped with white queso & a spicy tomatillo jalapeño salsa, served with guacamole & sour cream. Two flour tortillas filled with smoked steak, eggs, sautéed peppers & onions, topped with Mexican cream. Served with fruit or breakfast potatoes. Eggs topped with sautéed peppers & onions, mixed cheese, & your choice of chorizo, carne aside, ground beef, or smoked chicken. Served with fruit or breakfast potatoes.